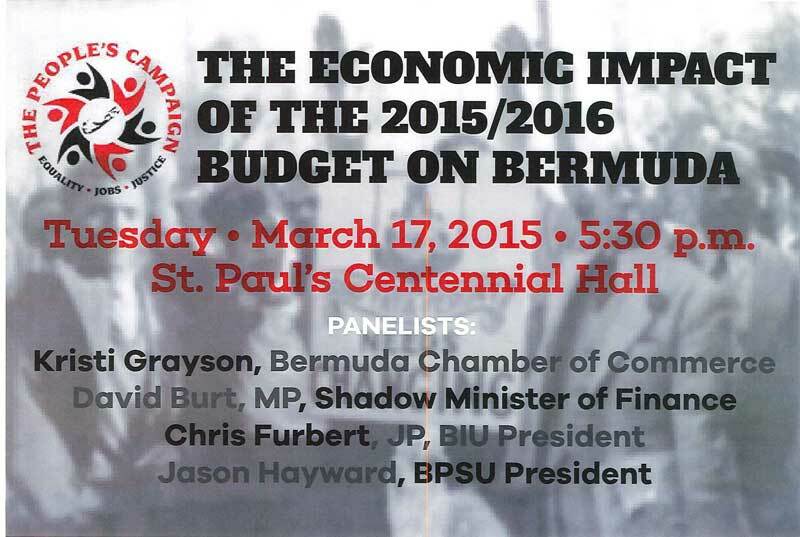 The panelists will be Kristi Grayson from the Bermuda Chamber of Commerce, Shadow Minister of Finance David Burt, BIU President Chris Furbert, and BPSU President Jason Hayward. Oh good, I was wondering how I should feel about the budget, now I will be told! With a panel like this, what do / can you expect will be the results of said meeting? really interested in the peoples opinion he would show up. Once again this government has proven, that they are really not concerned about the Bermudian people, the fact that the minister sat on a panel with the corporate establishment, but refuses to come to a town hall meeting with the everyday working people says a lot. Bermudian PEOPLE? That is a trade union and PLP panel. I am Bermudian and frankly not in the least interested to hear what these people have to say about this island’s finances. They are collectively the reason why we continue to struggle economically. Remember the respect the ‘general public’ had for him the last time he attended a town hall? Maybe because the last time Minister Richards tried to talk to these people, he was shouted down by a bunch of idiots who know nothing about the economy and just want “jobs”. They don’t want one of the 200+ jobs posted on Bermuda Job Board, though. What they actually want is the government to just give them a living wage so they can continue sitting on a wall all day. Proapaganda at it’s most vile. Let me take a wild guess. There should be more borrowing and more spending. Especially on making sure we pay double time, that’s a really big thing. And oh yeah, we need to diversify into online gambling and sea bed mining. I nearly forgot. For anyone that cannot see the truth,I’ll make it easy for you! Why don’t you all attend and give your point of view in person.